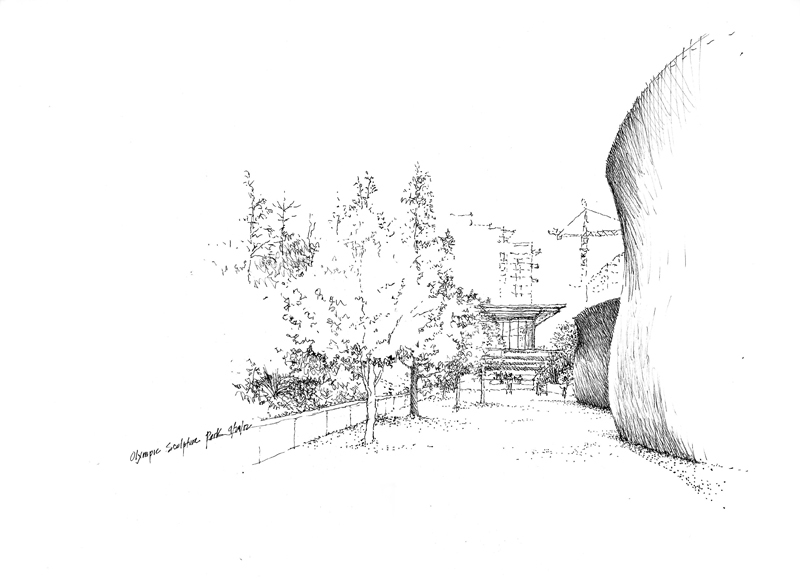 A few Seattle UrbanSketchers joined Washington State University students and their professors Bob, Kathleen, and Linda in a sketching session yesterday at the Olympic Sculpture Park. Here are a couple of my drawings to continue my previous post about drawing on location. A photograph, whether viewed in print or on a computer screen, is a static, two-dimensional image that makes it easier to see shapes, patterns, and relationships. For some, this is an advantage. But it can be a hindrance if the flatness of the photograph prevents us from interpreting, composing, and editing more freely the visual and spatial relationships before us. When drawing on location, we are not required to recreate or reproduce exactly the visual information that a camera might capture. We can squint or “look askance” to see light-dark patterns better; we can shift our gaze slightly to block out visual noise or improve the drawing composition; we can deliberately underplay some of the visual information to emphasize others. For example, the sloping ground and trees on the left and part of Wake, the large steel sculptures by Richard Serra in the foreground to the right, frame the PACCAR Pavilion beyond. So as not to lose the pavilion, I only suggested the apartment buildings in the background. This editing was easier to do on-site than if I were drawing from a photograph. As I mentioned in the previous post, the drawing process often leads to unexpected results. 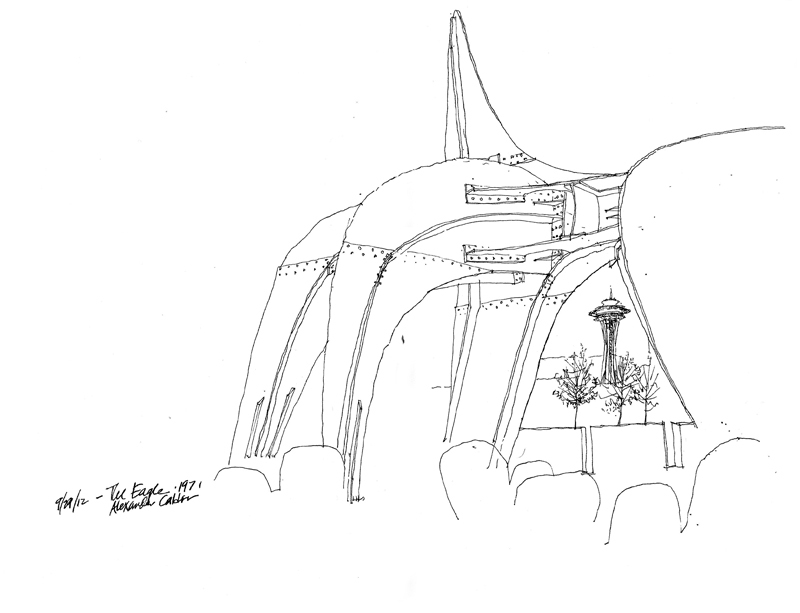 I selected the spot to draw Alexander Calder’s The Eagle so that it framed the Space Needle in the distance. My intention was to draw the entire sculpture but soon after I started, I realized the image wouldn’t fit if I were to maintain reasonable proportions. So I proceeded to draw as much detail as I could and omitted the rest so that I would not lose the sculpture as a framing device. 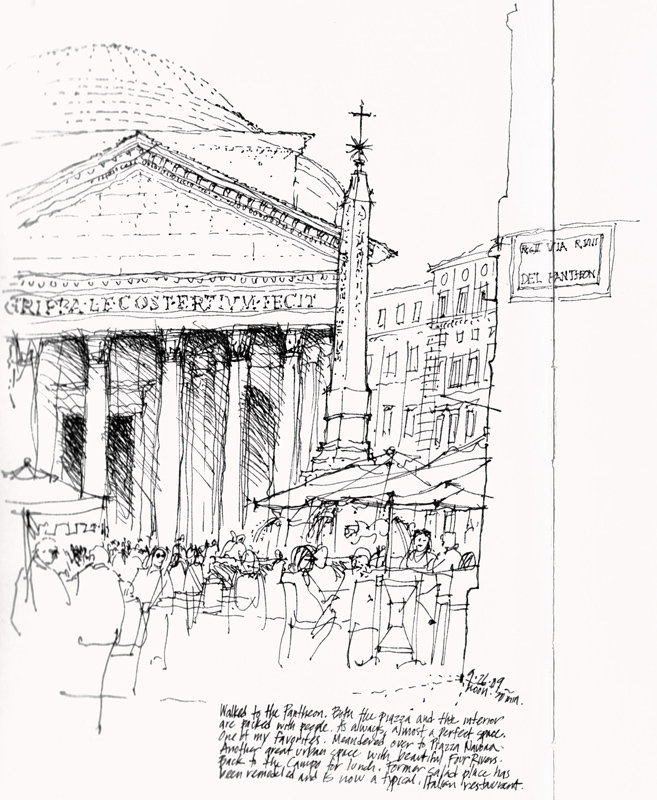 Drawing from a photograph is very much different from drawing on location, from direct observation. A photograph captures a moment in time and reflects the processing that flattens out three-dimensional data onto a two-dimensional surface. 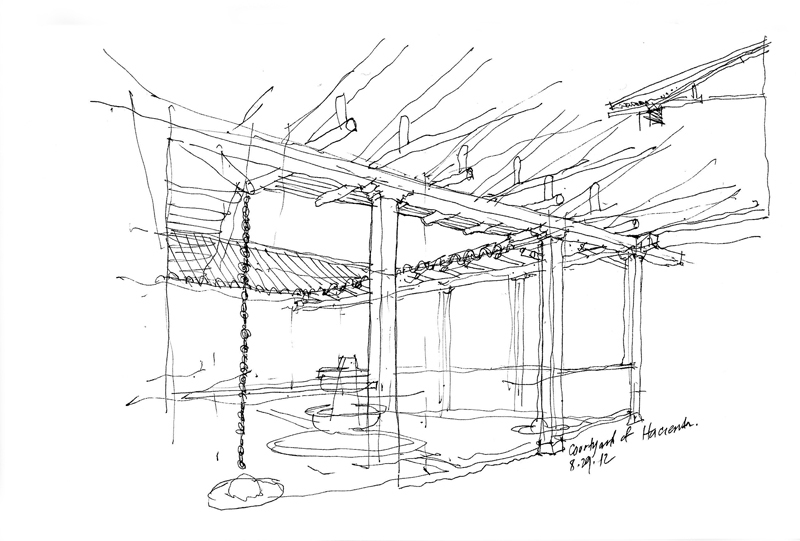 Drawing on location takes longer to execute and involves our senses, especially that of active seeing. And like a conversation, we do not know precisely where the drawing process will lead. Even though we may have an objective in mind when we begin to draw, the sketch itself takes on a life of its own as it evolves on paper and we have to be open to the possibilities the emerging image suggests. 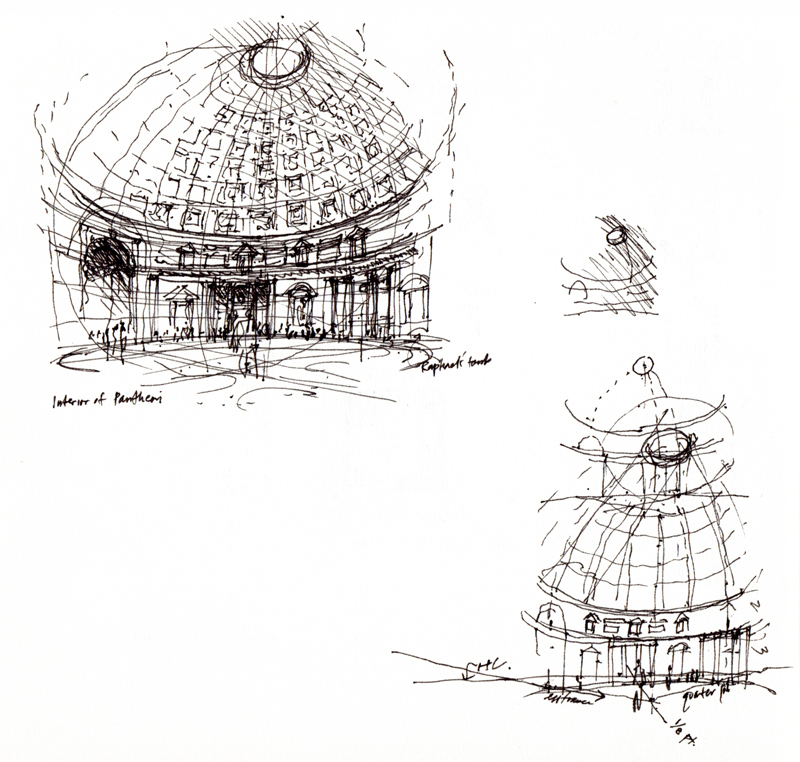 To illustrate, here are three drawings of the Pantheon in Rome. 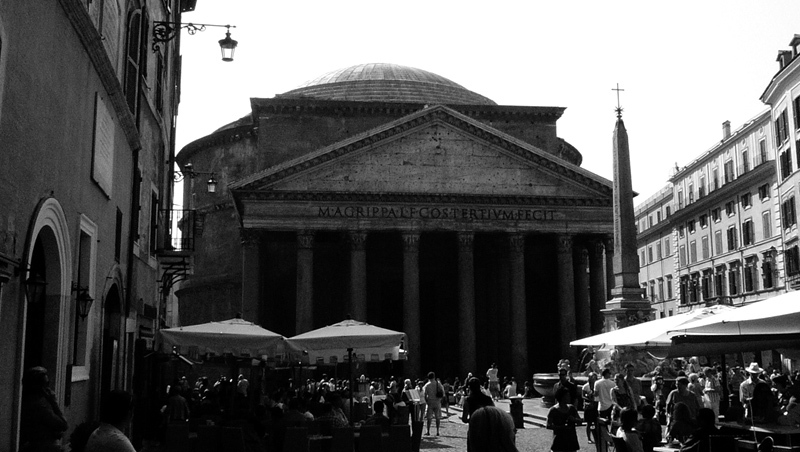 On almost everyone’s favorites list, the Pantheon is difficult to pass by without stopping to admire it, both from within and from the Piazza della Rotonda. 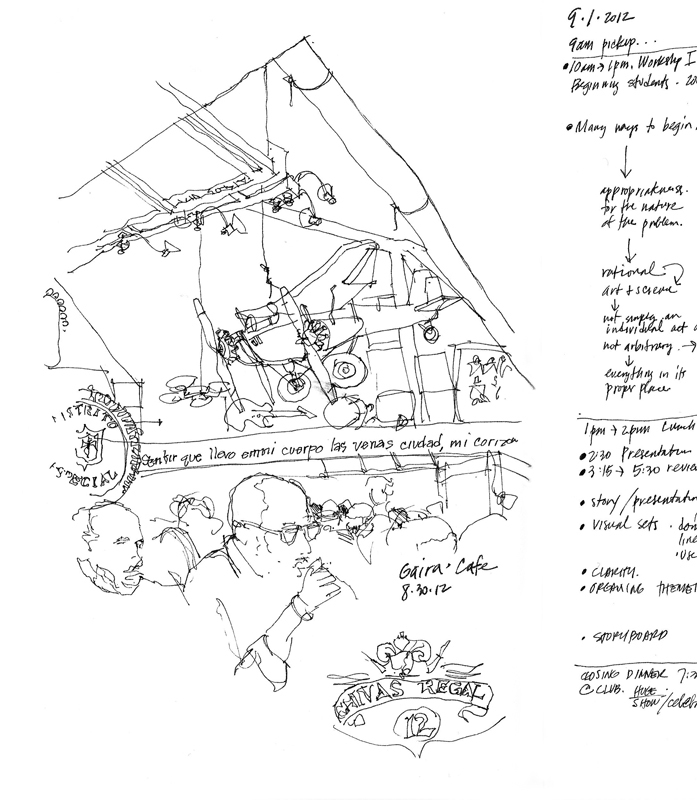 The drawings, done in 2000 and 2003 illustrate similar viewpoints but different approaches to the same subject portrayed in the photo. An important principle that can be applied to any drawing, regardless of the style or technique one employs in its execution, is the principle of contrast. Without contrast, we see none of the differences that contribute to identity and meaning—distinctions in line weight, tonal values, textures, details, and the use of white space. Here are three examples. 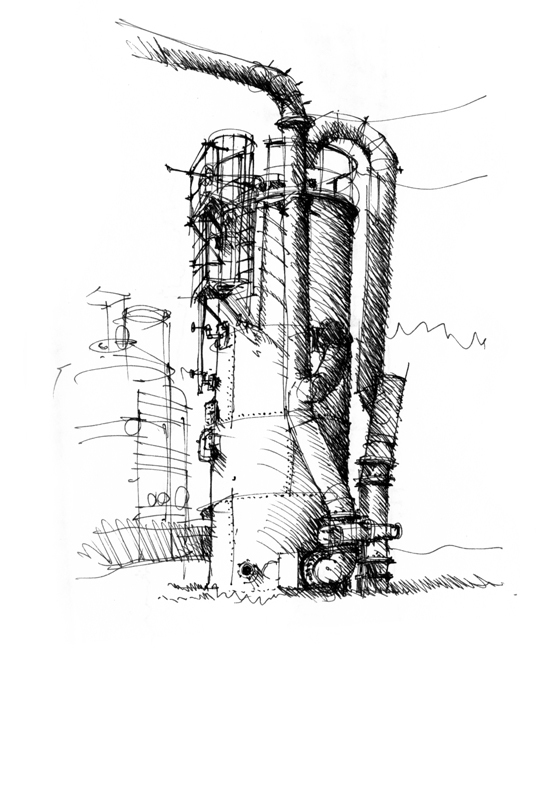 The first is of structures at Gas Works Park, where I exaggerated the range of tonal values—making the dark values darker than they really are and correspondingly, lightening the light areas—to emphasize the cylindrical nature of the tanks and pipes. 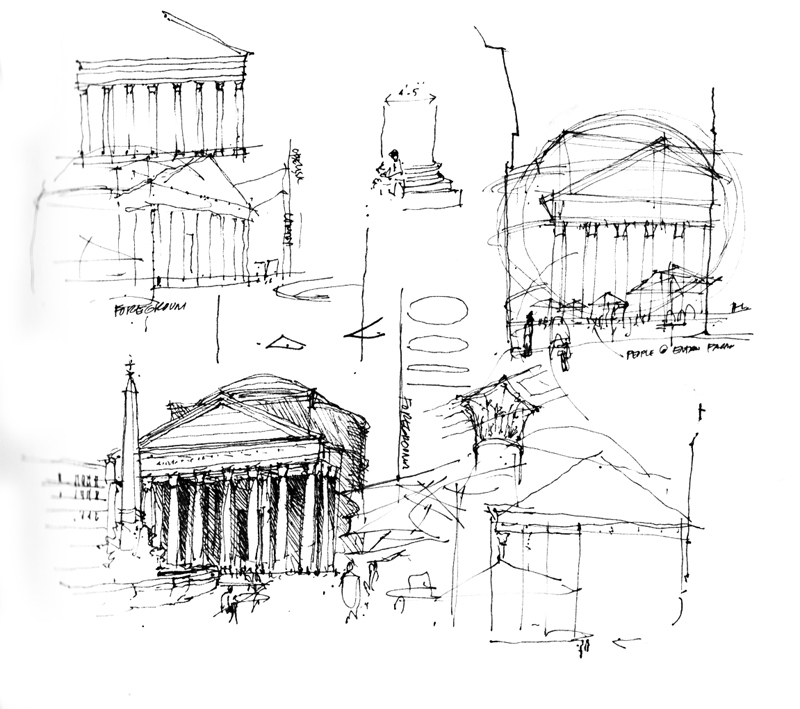 The second is of the Pantheon, where I used a simple contour line to define the building in the foreground, drew some details to establish the people-filled space of the square dominated by the obelisk, and applied tonal values to draw attention to the portico. The third is of Red Square on the UW campus. 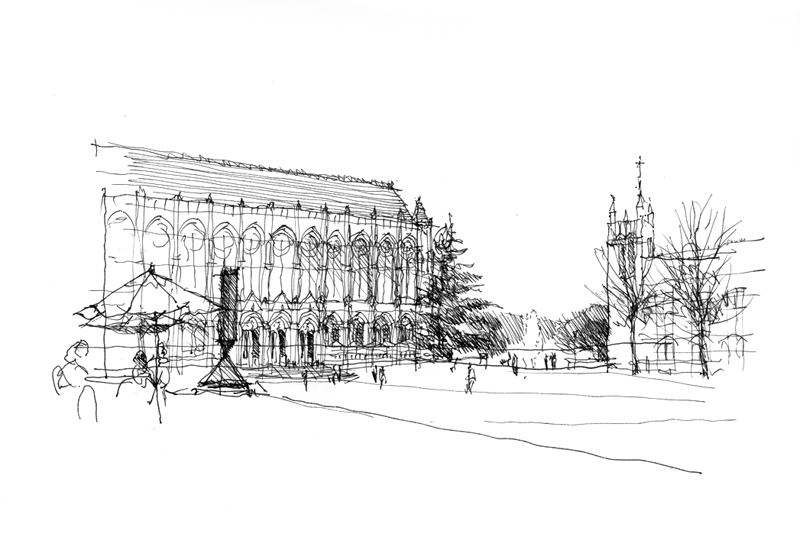 Here, I deliberately dropped off detail on the facade of Suzzallo Library from right to left so that the darkened obelisk sculpture would contrast with and stand out in the left foreground. From there, the eye moves from the obelisk sculpture to Rainier Vista on the right between Suzzallo Library and Gerberding Hall. 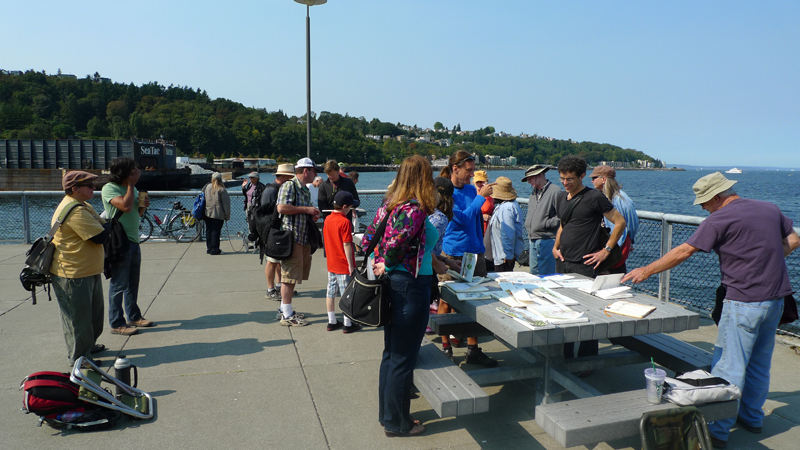 We had a great turnout on a beautiful, sunny Sunday morning for the Seattle UrbanSketchers meet-up at Jack Block Park in West Seattle. 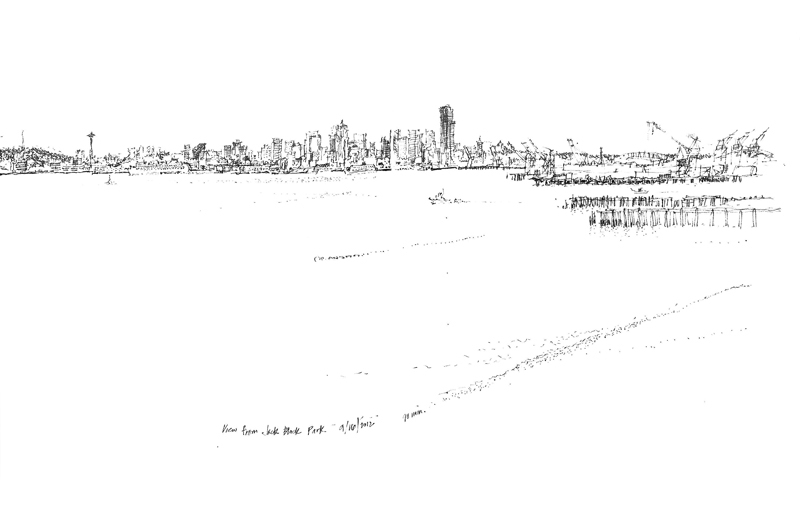 While a few sketchers drew close-up views of the marine and industrial facilities, many of us were seduced by and tackled the Seattle skyline. The expansive view stretched from downtown Seattle north to Queen Anne Hill, across Interbay to Magnolia, and finally across the Sound to the tip of West Seattle. Because I was drawing in a 5″ x 8″ sketchbook, I decided to use three page spreads to cover the panorama and join them later in Photoshop. Here is the first spread showing the downtown area from the Space Needle on the left to CenturyLink Field and Safeco Field on the right, with the Harbor Island industries in the foreground. This next view is of the entire panorama after the individual spreads were knitted together. It’s quite small here but the original is about 26 inches wide. [Note: I’m reposting this from my Facebook page from January 2011.] 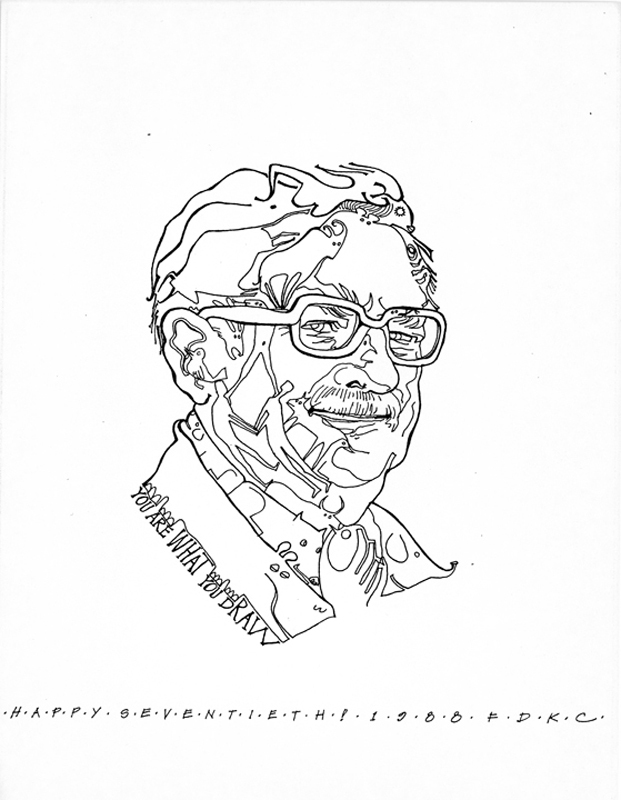 As I was going through my old files last year, I rediscovered this portrait of Forrest Wilson that I did for his 70th birthday. I owe Forrest more than I can ever repay for what he has done for me and my family. As Director of the School of Architecture at Ohio University, he offered me my first teaching position and was also responsible for my entry into the publishing business when he showed my drawing course notes to Van Nostrand Reinhold, his publisher in New York. 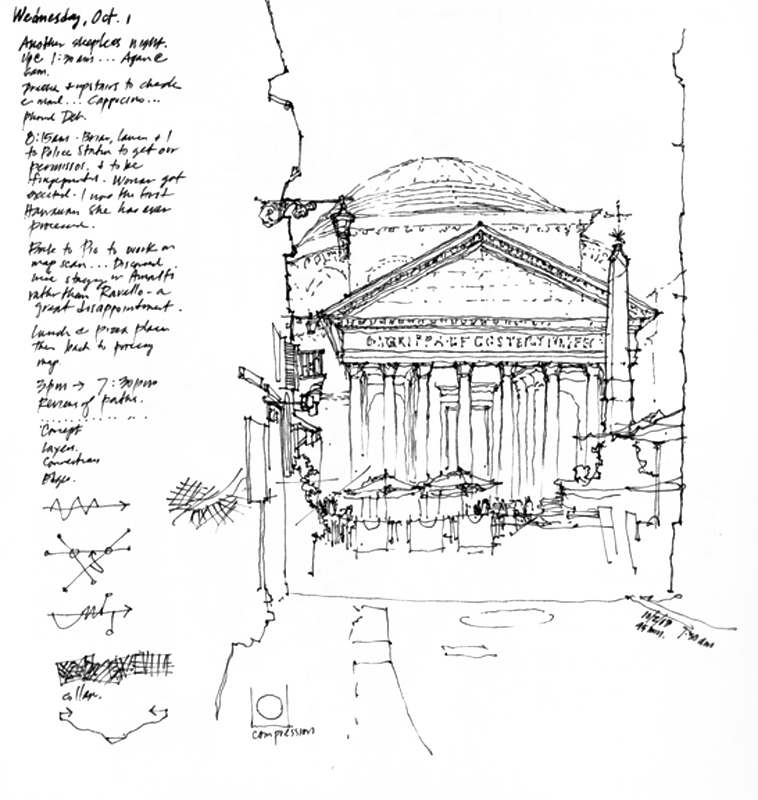 The notes were subsequently published as Architectural Graphics in 1975. Forrest is warm and generous—an artist, sculptor, writer, and builder who has written and illustrated many delightful and insightful books, such as What It Feels Like to be a Building; The Joy of Building; Structure: The Essence of Architecture; A History of Architecture on the Disparative Method: With Apologies to Sir Banister Fletcher (all eighteen editions). I titled the portrait: You Are What You Draw. If you look closely at the drawing, it incorporates the animal and human figures that Forrest used to illustrate his books. During the recent conference in Bogotá, we went to the Gaira Café Cumbia House owned by Grammy Award winning Colombian singer, composer, and actor Carlos Vives and his brother Guillermo. Offering typical Colombian food, drink by the bottle, and live music, the place was packed on a Thursday night with people dining, drinking, and dancing in the aisles. This is a view from our balcony overlooking the stage where the house band played traditional Vallenato and Cumbia music perhaps interpreted in a modern way. Local color, local music, local dance. 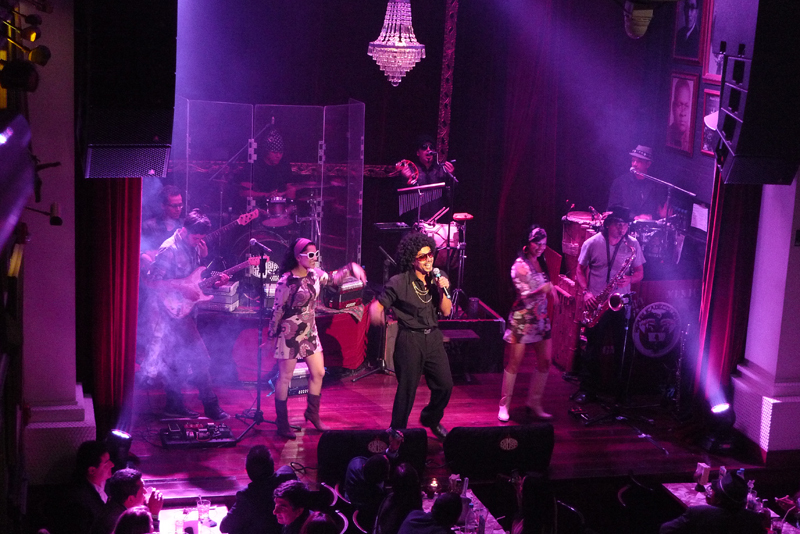 Check out <http://wn.com/gaira_cafe_cumbia_house>. My wife and I had a wonderful time visiting the dynamic city of Bogotá; meeting conference contributors from Spain, Portugal, Argentina, Brazil, Chile, and Canada; and enjoying the warm hospitality of the faculty and students of the Universidad Piloto de Colombia. While touring the city and the surrounding countryside with the group in a bus, it was difficult to stop for any length of time to draw but I did manage to sketch a few scenes. This first view shows what is possible even if you only have a few minutes to draw. 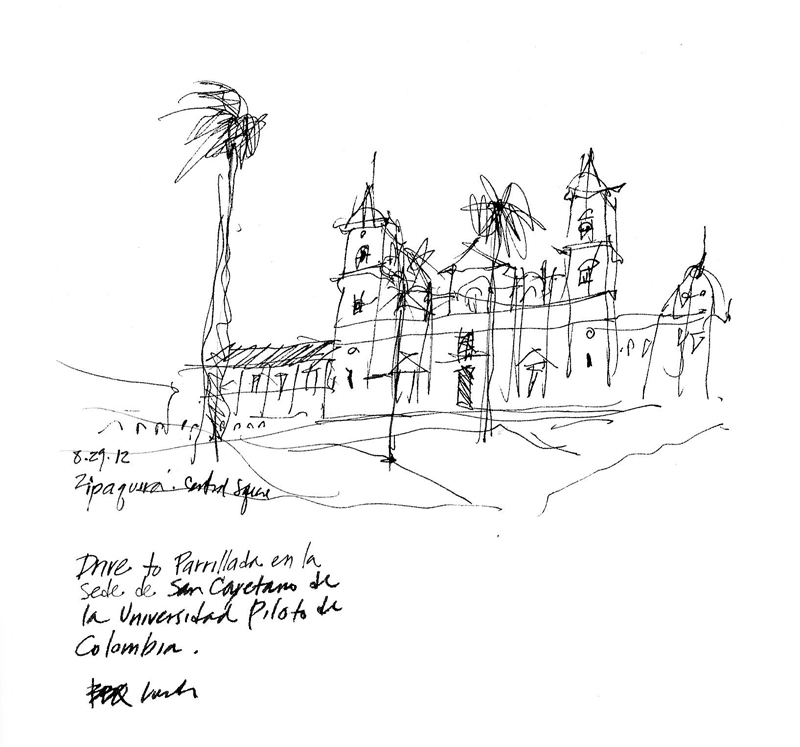 While the bus dropped us off on one corner of the central square in Zipaquirá and drove around to pick us up in the opposite corner, I managed to quickly sketch this view of the cathedral, noting the way the slope of the square was integrated by mounding the brick pavement around the palm trees. After a tour of the Catedral de Sal and a quick run through Zipaquirá, we drove to the historic Hacienda San Cayetano for a BBQ lunch. This is the courtyard of the hacienda, where a local Colombian noted that we unfortunately transport forms and traditions that are not compatible with the local climate. In this case, the water feature of the courtyard that worked in warmer, dryer climates wasn’t quite as effective in the humid conditions of the high plateau on which Bogotá is located. A few days is never enough time to fully understand the culture of a place and this is even more true when visiting a country as diverse as Colombia but I hope to return again in the future.